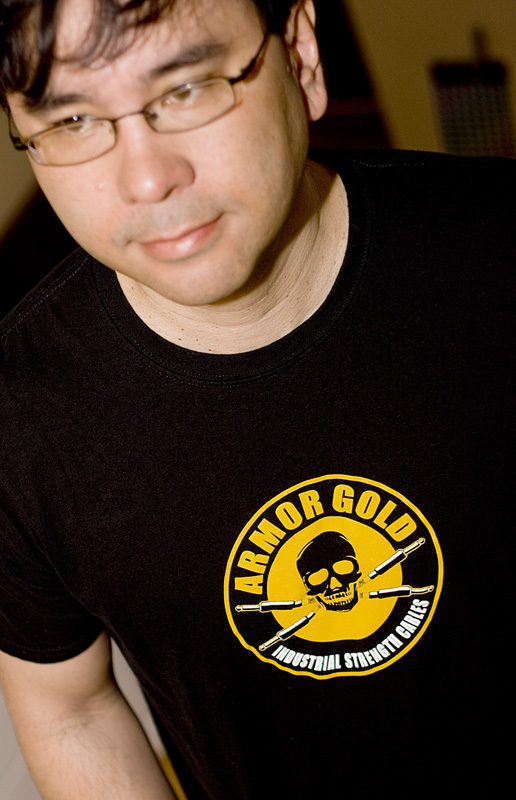 Today’s Free Shirt Wednesday is Armor Gold Cables! I few weeks ago I introduced Armor Gold Cables to EffectsBay.com users, and Dustin from Armor Gold Cables was kind enough to send me a shirt (and a cool sticker) for Free Shirt Wednesday this week! If you haven’t checked out the previous post about Armor Gold Cables, please do so – in that post I had a mini interview with Dustin, and it’s interesting. You can read the post here: “Introducing Armor Gold Cables“. Armor Gold Cables makes high quality instrument, patch and speaker cables. They focus on medium-low capacitance wire for great tone, hitting the sweet spot of 33pf to get maximum warmth and clarity. Often times cables with super low capacitance will be too trebly, high capacitance cables are too dark, so they shoot for that ideal range. Dustin sent us a cable to test, and we used it on a few upcoming demos, and it sounded great. It wrapped nicely and you could tell it’s durability with the polymer outer mesh on the cable. Plugs were solid, and the tone was as described. Nice. If you’re looking to pick up a new cable or two, make sure to check out Armor Gold Cables. If you like the shirt, you can pick one up on their web site as well! Want to know more about Armor Gold Cable? Check them out on MySpace, Facebook and Twitter as well.